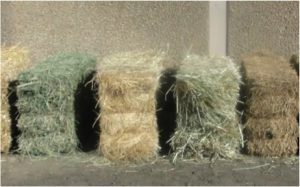 Horse owners may be exploring alternative feedstuffs due to high hay costs, poor quality hay, and/or challenges associated with finding sufficient quantities of hay. When possible, quality hay should make up a large portion of a horse’s diet. However, the following alternatives can replace hay, in partial or in whole, when needed. Always consider the pros and cons when selecting an appropriate alternative feedstuff, and before feeding, consult your an equine nutritionist and/or veterinarian. Posted in Hay, horse, Uncategorized. Struggling to Harvest Bermudagrass? Is Baleage an Option? Posted in Drought, Uncategorized, Workshops.